Grow your very own avocado with this ingenious planter kit. 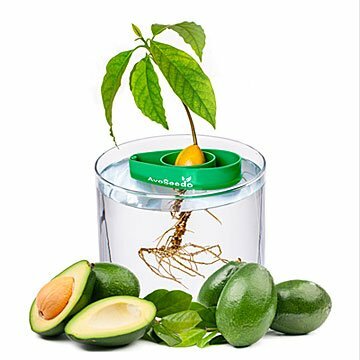 Avocados are the gift that keeps on giving, and this avocado tree starter kit makes it easy to double your green. Simply insert the shiny seed of your last avocado into the pod, float it in a water bath, and patiently watch your windowsill set-up sprout signs of life. This expertly designed floating planter easily holds a toothpick flag to mark your progress from day one to avocado toast. Glass bowl is not included. Made in China. Glass bowl and avocado pit not included. Please note, depending on the type of breed and temperature it can take 1-3 months until the avocado pit germinates and starts growing. Great way to start an avocado tree - plant and give as a gift!! I'll be using this site for most of my gifting needs! My best friend loves this Christmas gift! The product is exactly as it's advertised. Christmas gift for mom. She thought it was so cool. I supplied everything from the containers, the avocados to the gift boxes I packed them in. The instructions print was too small, so I had to make copies and then enlarge the copies. The 6 of us decided we would start our avocados on January 2nd and call each other to check on the progress of the plants every six weeks. Everyone was so excited about their gifts, I also included the Palm tree grow kit in the same box as a second project! Perfect gift for avocado lover! We both can't wait for the tree to produce fruit! Perfect for my friend who loves growing and nurturing her own plants. Easy to use.